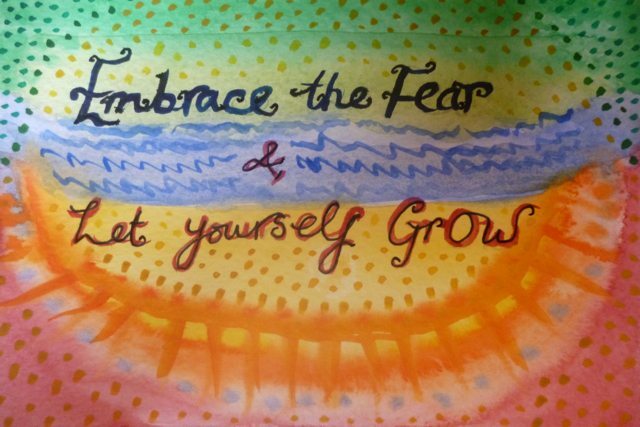 It can feel like a squirmy, cringe-inducing experience at times, learning to love and accept yourself just as you are while allowing yourself to reach for more and to grow. It’s not all pretty self-affirmative mantras to repeat while eye-balling yourself in the mirror and telling yourself that you are fab. You have to dig in deep, get dirty and look at the not so glorious chunks of yourself as well as the loveliness that lies within. What can I keep? What can I let go of? What elements of myself can I forgive and keep with me anyway and love her regardless? Can I cope with accepting myself as intrinsically okay right now while still relishing the opportunities to grow and evolve while at the same time still putting in the hard graft of working on the yucky stuff? It’s uncomfortable and unnerving to go through the process of improving yourself for the better and more to the point, coming to the slow dawning realisation that even though I may be lovely (or so I’m told!) that there has to be room for some sort of audit on the parts of myself that may not be so lovely, to take a good long look at the warts and flaws that may need reigning in and the worlds within myself that had gone to seed with neglect. “But sure I’m lovely, what’s to change? !” Well, under close and unforgiving self-scrutiny it turns out there is plenty! Yep, to be fair there are exquisite and enchanting parts of myself that I can gladly lay claim to (thank Christ!) but I can’t carry myself on those alone. I have to choose to own the parts of myself that had stopped growing (and were turning feral amongst themselves), the parts that had become stagnant and toxic. It is pretty safe to say that at the onset of my healthy lifestyle campaign I had to face that my own personal, spiritual and emotional growth had pretty much flat-lined. Going through the process of growing from what I had become to what I want to be and know that I can be and all the while ensuring I am taking action from a place of self-love and not a place of self-loathing is critically challenging. Shedding your old skin to make room for the new vibrant skin to grow is painfully scary and throwing up a load of troublesome feelings and sensations that I just have to steel myself for to get through. Feeling all exposed, feeling under threat, feeling unprotected, dealing with the reluctance of leaving the comfort of what I know, despite how much it was suffocating me and sapping my spirit. When you have chosen for a long time to stop growing, to stop reaching, it can leave you dealing with contrariness when you have to dig yourself out of the hole you put yourself in in the first place! Where was my vibrancy, my zest for life, for MY life, gone? Who was this decayed ruin of a woman that I had become? I had resigned myself to the ordinary. 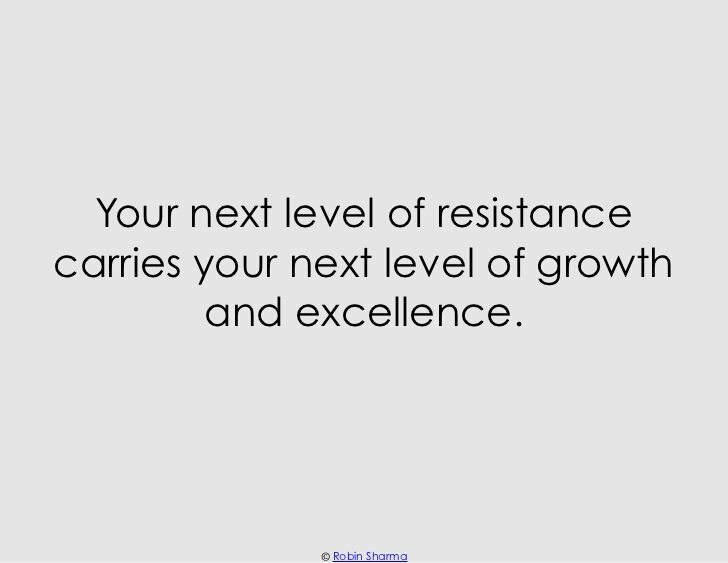 I had accepted mediocrity from myself and it was no wonder it had become expected from me sometimes from others. I was not happy with what I had produced in parts of my life so I have chosen to own it and it has been heartbreaking. With the help and insight of my friend Eleanor I have realised that I had come to focus on the perceived threat factors of my life. I had been living with feelings of anger, anxiety and fear, with the overall focused outcome of feeling safe and protected within myself being paramount. It was all-consuming. The activating factors of my life where drive, adventure and vitality resided weren’t getting a look in. The bonding factors fared better with focus on the emotional bonds in my life but the overriding system to the forefront was always my perceived threat system. I had permitted toxic thoughts and beliefs to flourish and quite literally fattened on them. The inner turmoil within and incessant ramblings of my ever present inner critical voice (who I had named Marge and way before Bressie gifted to us his book about himself and his Jeffrey!) wore me down. It had become normal to live from a place of fear instead of a place of excitement and hope and I had done it to myself. Food became a crutch that I relied on and my self-neglect and lack of self-love manifested itself in the horsing on of nearly 10 stone. I was my sickness but I was also my cure. No one else. I can only make progressive and meaningful steps from where I AM, not from where I think I am or from where I think I should be. To choose to ignore where I am is to choose to remain stuck and inactive. My reaction to stress and uncomfortable feelings has been for years to cocoon myself away from the world and eat. The last 4 months I have chosen otherwise and I am changing my life. My self-love and self-compassion is evolving and growing stronger the more I engage myself in developing the skills I need to sustain it and keep it alive. Attempting to make healthy lifestyle changes from a place of crucifying self-loathing has always led to dead-ends for me. This time I can see that the changes and active improvements seem more effortless and sustainable when I choose to launch myself at it from a place of self-love and self-compassion. 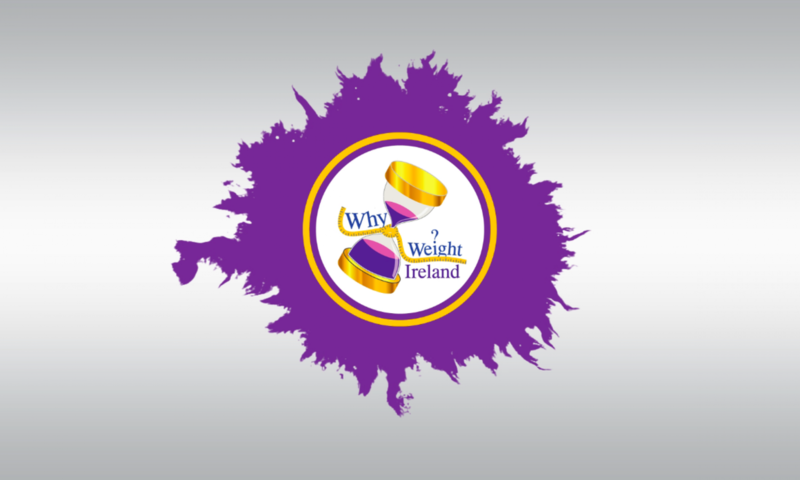 This week I have lost 1.2lbs bringing my total weight loss over 19 weeks to 3 stone 5.2lbs. Considering the sickness in the house this week, neglecting my food diary, the buttery toast and half -hearted and finally abandoned attempt to gorge on chocolate I am thrilled with this week’s result! Only 85.8lbs to go!! I have my menu plan for the week drawn up now and also my daily exercise penciled in and looking forward now to an engaging and exciting week ahead. When you fail to PLAN, you plan to fail! 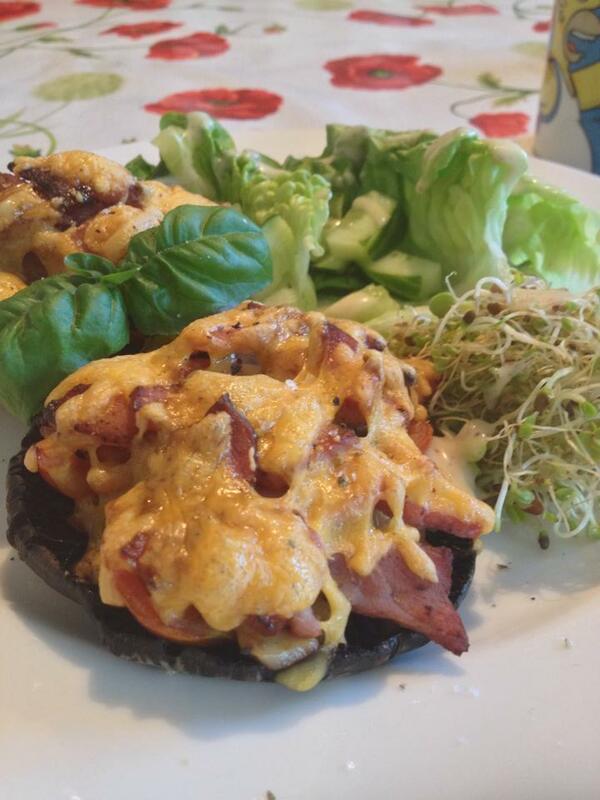 I love using mushrooms in dishes I prepare as I love the taste but they are also so very low in calories. The two large flat mushrooms in this recipe were only 17 calories altogether. I am alone in this house in enjoying this dish as my two chaps couldn’t be paid enough to eat a mushroom (although I always lash them into their spaghetti bolognese and when blended they are none the wiser.) This dish came to 288 calories in total. Preheat oven to Gas Mark 4/180 C. Heat the tomatoes, garlic, onion and bacon in a little Fry Light spray on a pan over a medium heat for a few minutes until the onion has softened and bacon is cooked. Spray a little Fry Light spray on the outside of each mushroom and place on baking tray. Divide the cooked mixture from the pan between both mushrooms, add a little freshly ground pepper and top both stuffed mushrooms with the grated cheese. Place mushrooms in oven and bake for 10-12 minutes or until the cheese has melted and the mushrooms have cooked. Serve with a salad of baby gem lettuce, cucumber, super sprouts and drizzle with honey & mustard dressing. Enjoy! Spread out reduced fat houmous on one slice of rye bread. 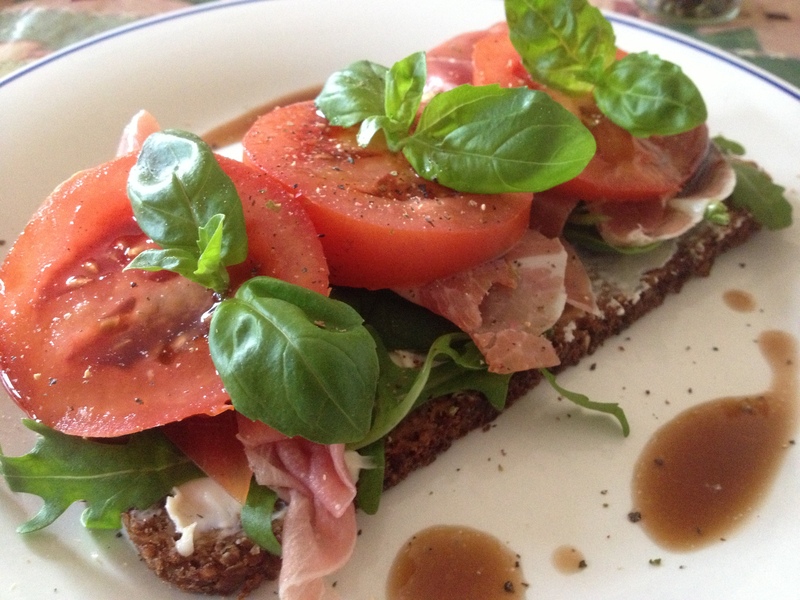 Layer the rocket, parma ham and sliced tomato on top. Drizzle the balsamic salad dressing over the tomato and around the plate. Grind a little fresh pepper and sea salt over the dish and top with the sprigs of basil. Only gorgeous! I came across this recipe in an old Prima Quick, Easy & Delicious Magazine and changed it slightly when trying it out myself. It surely was delicious and quick and easy to prepare! I used fresh lemons instead of preserved lemons and chose to use Fry Light Extra Virgin Olive Oil Spray instead of tablespoons of oil thus ensuring less calories. I also cut back on the potatoes, bringing the calorie count lower again as knew I could fill my plate with lovely vegetables too. Per serving this dish comes to 444 calories (not including the chicken skin now, be strong and decide not to eat it!). If you use just 2 chicken drum sticks instead of 2 chicken thighs per serving you can bring your calorie count down further by about 60 calories. Plating up with some lovely fresh vegetables gives you a lovely hearty meal. Enjoy! 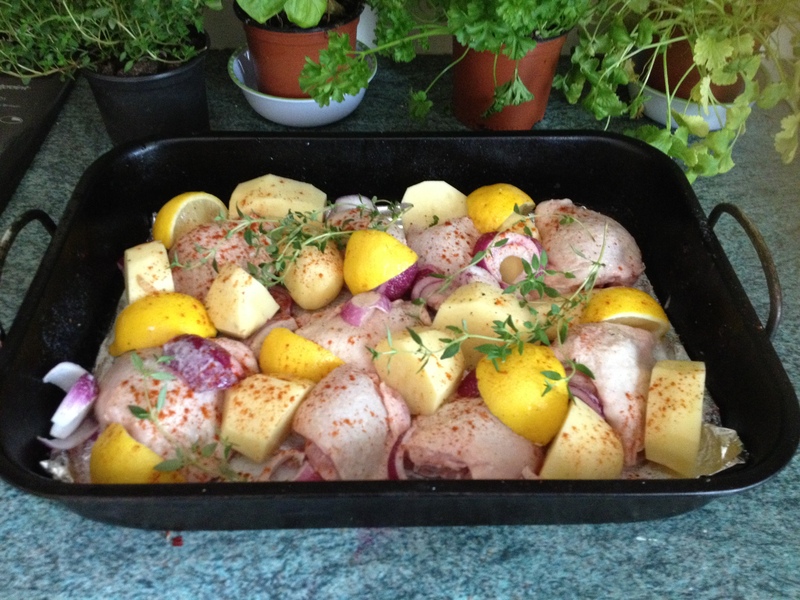 Preheat oven to Gas Mark 6/200 C. Place the chicken, onions and potatoes into a roasting dish. Squeeze a little of the lemon juice from the quarters over the chicken and place them then between the chicken pieces in the dish. Sprinkle over the paprika and season with freshly ground sea salt and freshly ground pepper. Spray the dish with the Fry Light spray liberally (only 1 calorie per spray) and mix up all the ingredients well with your hands so the chicken is well coated with the oil. Throw in the thyme sprigs on top. Place roasting dish in oven and roast for about 40 or 50 minutes, until you can see the chicken and potatoes starting to colour nicely. Once or twice during this cooking time I added a couple more sprays of oil and moved the chicken and potatoes about a little so they wouldn’t be sticking to the dish. After this cooking time, pour over the prepared hot stock and cover the roasting dish firmly with tin foil. Reduce the oven temperature to Gas Mark 4/180 C and continue to cook for about 1 hour until you can see the stock has reduced. Serve up with lots and lots of healthy vegetables!